We are pleased to feature a guest article written by Pat & Baiba Morrow from Invermere in beautiful British Columbia. " 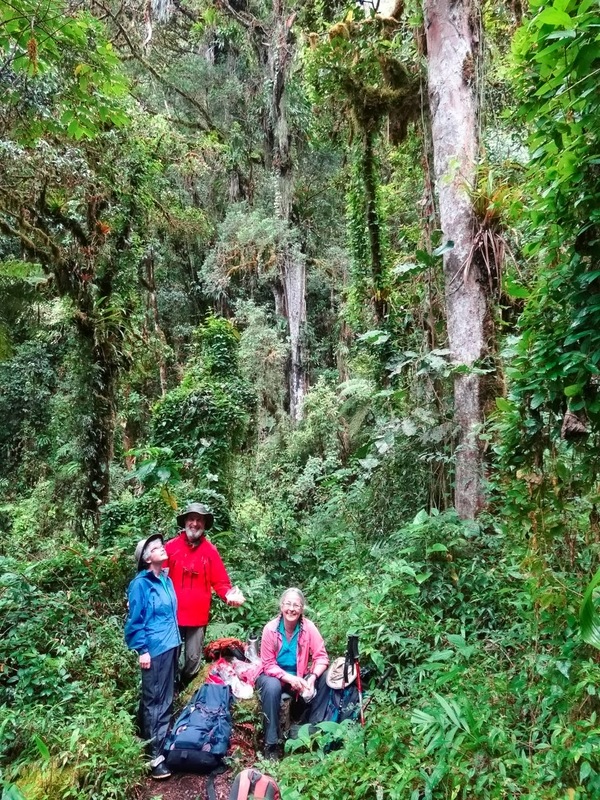 Pat and Baiba's love for indigenous cultures and the mountain world propels them on explorations in the physical, cultural, and spiritual realm. " In 1987 Pat received the Order of Canada in recognition of his achievement of climbing the highest mountain on all seven continents. 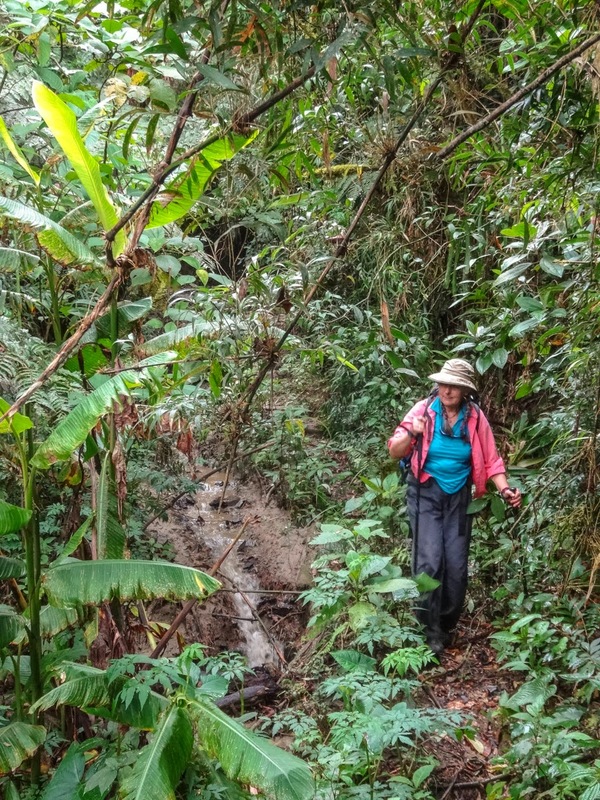 The accomplished photographers, journalists, and hikers are currently on a several month trekking adventure through Ecuador and Colombia. 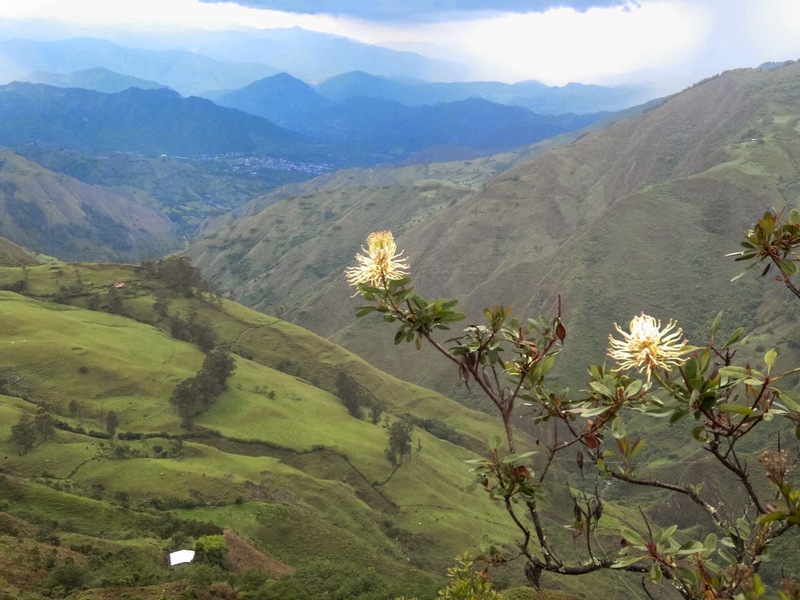 Their adventure starts in Vilcabamba, an area we have yet to explore and write about. This wonderful opportunity of synergy to receive new perceptions and excellent photography. 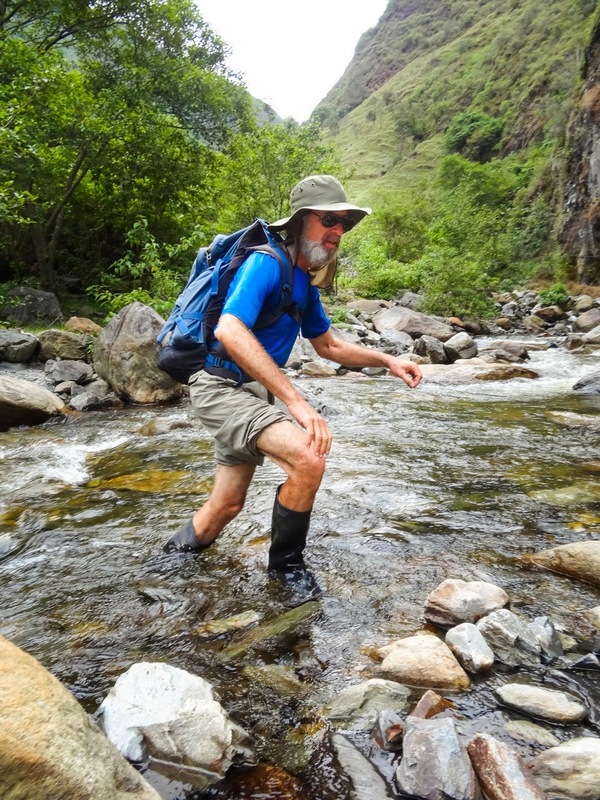 If you would be interested in a future adventure based photography expedition of discovery in Ecuador led by Pat Morrow please let us know. My wife Baiba and I jetted and bussed to Vilcabamba in mid December from deepfreeze Canada to kick off a 2.5 month journey north through Ecuador and Colombia. Part of the reason we chose that tiny town in the pleasantly warm mountainous area near the Peruvian border is that we have friends who are South American guidebook authors that live there. 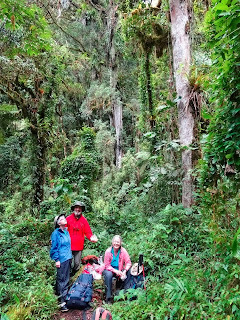 Inveterate hikers, they invited us to join them on a multi day backpack in Parque Nacional Podocarpus. 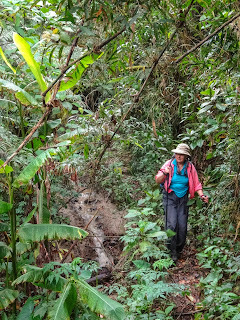 But before we got to Vilcabamba, an unplanned-for adventure began just south of Cuenca. As we dozed on the rollercoaster bus ride, my camera disappeared from my camera bag. The thief had boldly reached over the seat, opened the camera bag, and removed the body and lens (courteously leaving 2 more lenses untouched). I can't say we hadn't been warned, although I have to admit I was a little lax in taking precautions against this possibility. After all, at no time during our 35 years of travel around the world, with tons of climbing, trekking and camera gear in transit, we've never had anything stolen. Needless to say, this put a kybosh on my photographic plans. Our hosts graciously loaned us their point 'n shoot to grab a few snaps. Rainy weather modified our somewhat ambitious plans for this time of year (the semi-rainy season) and we ended up going on a binge of day hikes that made up for it. In order to stock up on food for the week, we arose at 5:30 am for the photogenic Sunday market, and I had to keep reminding myself then, and throughout the week, not to reach for my missing camera. From the center of town, you can see a myriad of ridge walks and loop hikes that begin on ridges and bring you back to town, or drop into other valleys and villagers where you can catch a bus or colletivo back – you can do loops all the way on ridge crests, or combine them with scenic descents via beautiful creek beds. And the more vantage points we got to, the more possibilities we could see. Of course, our hosts had scoped out all the classic lines and hiked them dozens of times, so we benefitted from their expertise. However, anyone with any amount of experience in the back country could expect to arrive in town and start hiking right away unassisted. 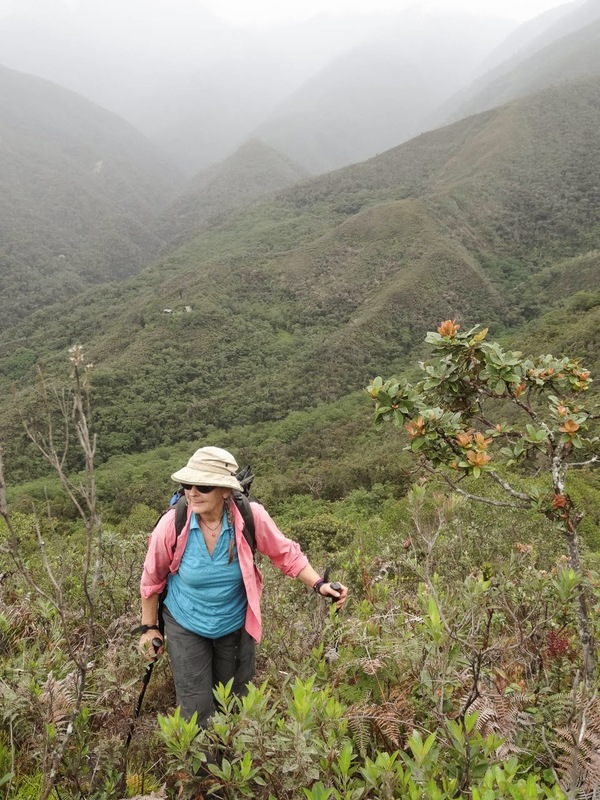 One thing to keep in mind is that many of the trails pass through private farm and grazing land, so the onus is on hikers to be sensitive toward not trampling people's fields and making the effort to ask permission to cross fields wherever possible. Another word of caution: there is a popular hike up Mandango Peak to the west of town where a number of hikers have been mugged, so be a little cautious about heading up there as an individual, choosing to go as a group instead. 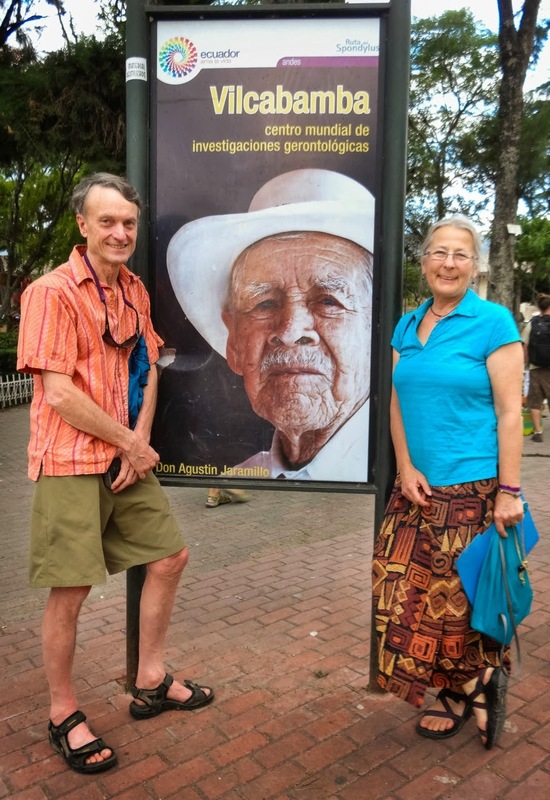 here's a snap of us in Vilcabamba, the idyllic town in southern Ecuador where people are reputed to live to be over 100 (which is about how old my knees are). we stayed w/our friends Robert & Daisy, who have written around 20 guidebooks to S American countries - Baiba was a classmate of Daisy's at McGill. Looking back down toward Vicabamba from one of many hikes, you can see the potential to explore these Andean foothills. Often, the trail is lost in the scrub brush, but you can often pick it up by forging ahead. Higher up, near the western boundary of Podocarpus park, the brush gets serious and you want to make sure you're on a trail. Good to see Pat y Baiba tramping around your neck of the woods. My wife and I are planning a hiking/climbing journey down there to research Annie Peck for a book.